Humans have been tanning hides into leather since the beginning of time. Tanning methods have evolved significantly over the millennia, of course. And as technology allows for softer, more fashionable, and more durable leathers, the appeal of this beautiful natural product only increases. Today, leather furniture is universally considered chic and comfortable and its popularity continues to grow. In fact, nearly 40 percent of all upholstered furniture sold is covered in leather; annual leather upholstery sales hover around the $12 billion mark. Leather Miracles was co-founded in 2000 by Tim Scopes and David Mathison, after they had worked together at one of the largest tanneries in the USA. Each founder contributes specialized expertise to the company and each helps facilitate successful partnerships with customers, partners, and vendors. Tim Scopes, who attended the respected National Leathersellers College in London, has an excellent reputation in the leather industry. As a stylistic and technical pioneer in innovating leather products, Tim has worked with tanneries and leather technicians around the world. Admired throughout the industry for his mechanical expertise as well as business acumen, Tim enjoys the challenge of experimenting and creating new leathers in the lab and tannery and taking them to market as a finished product. 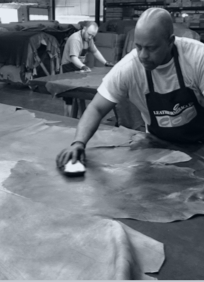 David Mathison has been a leader in sales and marketing in the leather industry for more than 40 years. He has worked with many firms, including running Lackawanna Leather, the largest tannery in the U.S. at the time, and built lasting relationships with tanneries, suppliers, and manufacturers across the globe. He is regarded as a trailblazer in the leather industry, for his creativity and embrace of innovation and new technologies. Backed by a wealth of experience, David has an unparalleled understanding of the market and consumer demand. Leather Miracles began as a tongue-in-cheek working title for a revolutionary start-up, created by David Mathison and Tim Scopes. These two experienced leather executives were about to do something no one had done before — and they joked that it might require divine intervention to be successful. The new idea was to arrange joint ventures with tanneries and finishing plants all over the world, instead of building one centralized facility. Too busy selling their beautiful globally-sourced leathers to think of a new name, Mathison and Scopes stuck with Leather Miracles. The company has been an industry leader ever since, with its slightly curious, but memorable, name.